Every week American Urbex receives requests from adventurous readers regarding locations. Although well-composed and spell-checked prose is always flattering, the requests go largely unfulfilled. At the bottom of each feature article there is a list of online resources. Maps and photos help create a compelling article, but the real gold is in the public information that supports it. The short answer as to why location requests go unanswered is simple: Google it. Granted, that may come off as short-tempered and cliché, but the long answer is more nuanced. The genesis of an American Urbex article begins with Google. Consider this article a lesson in Urbex Methodology 101. Today we’ll be talking about some of the basic methods for finding urbex locations with Google. Yes, this will be on the exam. Let’s begin. Photo: The urban explorer congregation regularly meets at this famous Gary landmark. 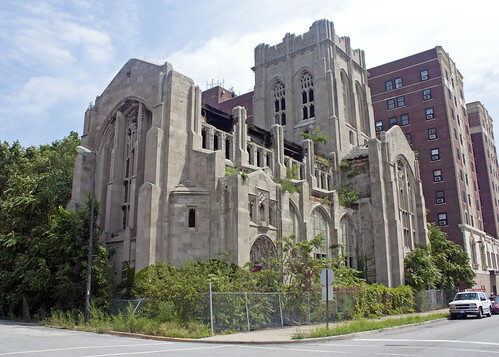 Let’s take a well-known and previously researched location like the United Methodist Church in Gary, IN. The church is considered a mecca of sorts for urban explorers. Mainstream photographers have even embraced the location and use it to shoot wedding photos. There is a lot of information out there so for the purposes of this exercise it will be easy. A basic search for “United Methodist Church Gary Indiana” returns about 196,000 results. Open some of the links in new tabs and you’ll come across wonderful resources. Check out this photographer’s impressions of the site, which was posted in April 2011. Sites like these give you a good impression of what to expect when visiting. The date is also extremely important too as it gives a good indication that the building is still standing. There is nothing worse than driving a long distance only to discover the building is collapsed or under active demolition. Pages such as the 1967 church directory are a wealth of information the tell the story of how the church began, what it looked like in its prime, and who some of the members were. Then there is the Wikipedia page for Gary, Indiana that mentions the church. The Wikipedia entry does not specifically say where the church is, but it does provide a vital clue in that it is downtown and not far from another abandoned building known as Union Station. Union Station is a great example of how one urbex location usually means that there are more in the vicinity. The Wikipedia page for Union Station explicitly lists the GPS coordinates on the right side of the page. Figuring out where the church is should not be too difficult if we plug (41°36’20.3N” 87°20’13.07″W) into Google Maps with satellite view. Scroll slightly to the south and west a few blocks and there it is, right in the heart of downtown Gary. If you enter street view you can see the building from the outside. This gives you a good indication of how to enter a location, what is in the neighborhood, and many other clues about what to expect. Also pay close attention to the details on the roof of the church and look for similar style roofs near by. There are a decent number of similar roofs down Broadway. If you inspect Broadway with street view you will notice the decaying Post Office and other retail stores that have long been abandoned. Knowing the neighborhood topography is useful, but it also helps to know the history. Invariably you will come across people in the neighborhood who are curious about what you are doing there. It helps to arm yourself with a little knowledge about the location and prove that you are a respectful guest. Google Books is an excellent resource for familiarizing yourself with a location and the role it played in the broader community. Books like Gary’s West Side provide key facts and photos of locations. Tomes such as City of the Century: A History of Gary, Indiana chronicle the rise and fall of what was once one of America’s strongest industrial cities. Armed with this information you will gain insight on what to look for when going through the city. Now that you have googled to the point where you are confident enough to explore the streets of Gary, the key is going to be making both intellectual and personal connections with that information. You need to get out there and explore the world. Most importantly, you need to share what you have discovered. That’ll be all for today’s Urbex Methodology lesson as we’ve come to the end of the hour. Thanks for the link to Love Above Photography’s blog post about United Methodist Church in Gary, Indiana. I have been there multiple times over the last few years and I am sad to see how hard that the last year has hit this once beautiful landmark. I’m not sure if it is due to the elements, the scrappers ripping it apart, or the filming of Transformers, but the church has severely declined in the past year. It’s very sad to watch the decay of what was once a pillar of a bustling community. I’m visiting Chicago soon, like next week, and am trying to gather some places to hit up. Union Station and the church seem like good easy grabs. I dont have long, and am there on business, but I’m looking forward to shooting in Chicago. Bring the appropriate gear, make sure someone knows what you’re up to, and be safe. Not to nitpick, but its a little curious when you say you don’t reveal locations but if I Google, say, the Purple Hotel I might wind up on your site where I’ll find you’ve provided not only the city and the street in which its located, but also a handy aerial photo to identify it by. Sure, I’ve been there too and have posted my pics online, but I’ve revealed nothing as to its identity or location (and I’m waiting for demolition to start before I post my exterior pics). However, since people HAVE been busted here it might be worth mentioning on your site that there are security cameras even though we’re still uncertain if they’re actually working anymore. The Lincolnwood P.D. takes a much dimmer view towards trespassers than, say the Gary P.D. does if they see someone exiting the church. Just something to keep in mind. the church is a good location the meetup group raves about this place but i perfer large industrial complexes once a month they have a meetup at this place it seems. Ken thank you for indirectly sharing your locations. i have an issue with people not sharing locations, you don’t give an exact location but enough to find without problems. I’m not a photographer if you show me a cool pic i want to see the place with my own eyes not marvel over your selfish work. Locations are shared privately to minimize vandalism not to deprive others of the experience.